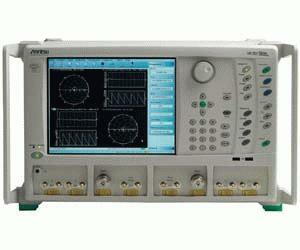 The Anritsu MS4640A VNA offers the broadest coverage in a single instrument, 70 kHz to 70 GHz. The additional two decades at the low end are even more impressive than the guaranteed 70 GHz coverage on the high end, for better device modeling without having to switch to another RF VNA. The industry leading 100 dB dynamic range at 70 GHz, coupled with excellent raw performance, will offer the best accuracy and stability to the toughest measurements. And when you can achieve synthesized sweeps at the industry fastest 20 µs/point, while achieving greater than 80dB sensitivity, the result is the best all-around VNA available on the market today, and for a long time to come. The Anritsu VNA is destined to become the ideal microwave VNA platform, built on an Open Windows architecture, with unlimited potential such as 100,001 points in single channel mode, with versatile connectivity, and intuitive interface.